IAAF Council member David Okeyo of Kenya was banned from track and field for life Thursday for his role in diverting hundreds of thousands of dollars of sponsorship money from Nike for his and others’ personal use. It was another case pointing to deep-rooted graft in the sport in Kenya, which has been the most successful distance-running nation in the world for decades but is seeing that reputation eroded by a series of doping and corruption scandals. Those scandals have swept across the Kenyan terrain over the last few years, implicating in various cases athletes, coaches and agents right up to the most senior officials. 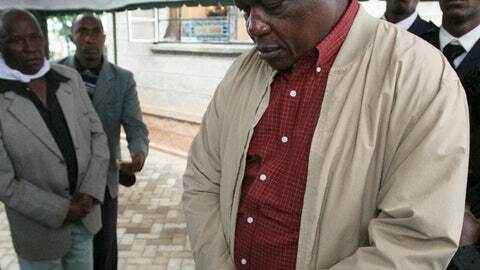 Okeyo, the former secretary general and a vice president of the Kenyan track federation, is also facing charges of extorting money from athletes in a separate IAAF ethics case that has links to the East African country’s doping crisis. In the Nike money case, evidence indicated that two other high-ranking officials at the Kenyan federation were also involved in funneling off cash. They were former Athletics Kenya president Isaiah Kiplagat, once a long-serving IAAF Council member himself, and former AK treasurer Joseph Kinyua. Kiplagat died in 2016 before he could face charges and Kinyua, although investigators found he was also involved, escaped punishment because he wasn’t bound by the IAAF’s code of ethics at the time of the offenses. Okeyo was, however, guilty of breaching the IAAF’s ethics code on 10 occasions and “over a long period of time,” a three-member IAAF ethics panel said in its written decision. Okeyo’s wrongdoing started as far back as 2004, the panel found. As well as his life ban, Okeyo was fined $50,000, which he was ordered to pay to AK. He was ordered to pay another $100,000 in legal costs to the IAAF. He was also formally expelled as an IAAF Council member. He had been suspended from his roles since 2015. The decision was announced by the IAAF ethics board following a three-year investigation and a hearing in Nairobi in January and February. “My lawyers will appeal the decision,” Okeyo said. He can appeal to the Court of Arbitration for Sport in Switzerland within 21 days. Kinyua claimed the case had “vindicated” him. But that wasn’t how the ethics panel saw it. The panel said he was “found to have engaged in similar conduct” to Okeyo but couldn’t be sanctioned under an old version of the IAAF ethics code, which has since been updated. The panel said evidence indicated that 16 payments totaling a little over $1.2 million between 2004 and 2012 were made from AK’s bank accounts to a separate account, which Okeyo and the two other men had access to and withdrew cash sums from. Okeyo wasn’t found guilty of siphoning off all of that Nike money, with investigators unable to get compelling evidence of wrongdoing on some. But large sums of the money were taken “for his own direct or indirect personal benefit” and not for AK business, the panel concluded. The IAAF hasn’t yet released any findings in Okeyo’s extortion case, which also involves yet another top AK official, former CEO Isaac Mwangi. Okeyo and Mwangi were charged with subverting the anti-doping process after an Associated Press report in 2016 detailed allegations made by two Kenyan athletes who competed at the 2015 world championships and failed doping tests. The athletes, Joy Sakari and Francisca Koki Manunga, told the AP that Mwangi asked them each for a $24,000 bribe to reduce their doping bans. He was suspended by the IAAF soon after.